Seems your pagefile grow and when you reboot it just used initial size. you shoudl move your pagefile to another drive. How do I do that correctly? I thought I had done that already (but maybe not correctly), but is it possible it needs to be done again? 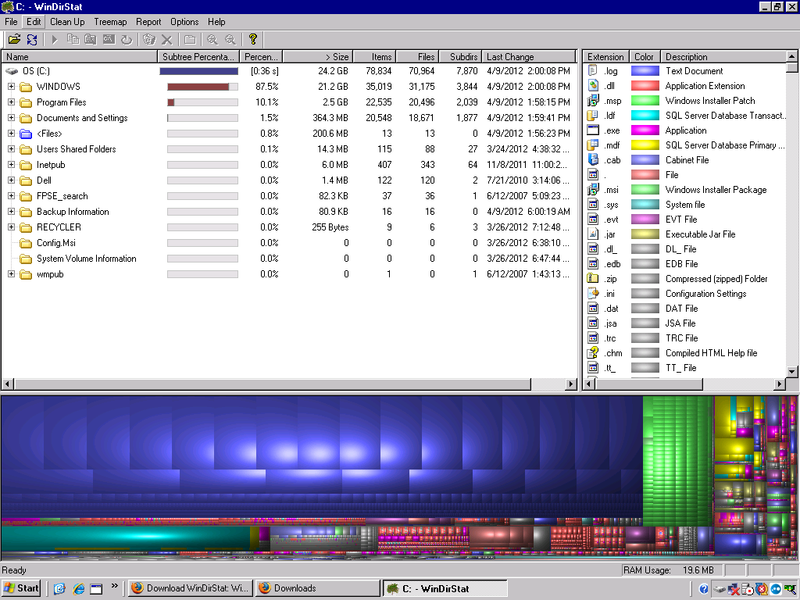 First before rebooting I would use http://windirstat.info/ to see what is eating the space up. Once you have determined this you will be able to fight the issue. can you provide the screenshot..
And here is what is using all the space. Also page files was already set to 200mb on the C drive. Can I delete those log files? What are they for? ok.. you can also keep treesize utility. this is really handy is scanning what folder is taking how much space. Wait, isn't that what windirstat just did? most of the time we can delete them..
just make sure they are not sql server transaction logs..
just see the content of few logs.. and if you think they are of no use then you can delete them. Yes that is exactly what Winstat did. I don't see anything you have posted. No attachments. how do I know if they are sql server transaction logs? It seems to freeze up notepad whenI try to open them. these are iis logs. delete them..
Goto IIS Manager, under properities of these virtual directories (in your default website), uncheck Log .. so that it does not occur again.. Okay, so some show up in black and others in blue. Is it safe to delete all of them? just delete the blue ones.. as these are .log files... can you provide what is the extension of black ones..
Go ahead and delete them..
Great. as you have disable iis logs.. this should not happen again..
> Great. as you have disable iis logs.. this should not happen again..
Great - and as long as you have them disabled, you'll never be able to tell if someone is hacking your mail server/web sites and IIS related services. Rather than follow what I consider poor advice about both deleting logs and disabling logging, MOVE THEM. ARCHIVE THEM. Don't DELETE and don't DISABLE. Will you ever need them? Who knows. But I HAVE had to review them for clients on occasion. NOT EVERY CLIENT, but sometimes it happens.